In accordance with the College mission statement we strive to create a supportive and caring ethos in St. Mary’s College for each member of its school community. St. Mary’s College is a Catholic school in the Marist tradition and reflects the Marist education and religious philosophy. The educational community continuously develops and maintains effective communication and mutual respect between the trustees, management, staff, students and parents/guardians. As a responsive school it responds to and caters for the particular spiritual, personal, social, academic and vocational needs of its students and potential students. St Mary’s College aims to provide an environment of excellence and care for each member of its school community, based on Christian values. We value an ethos of pastoral care whereby pupils feel that they can approach staff and that staff will respond to such pupils in a caring Christian manner. More than anything else we seek to nurture positive relationships as the core resource in developing a pastoral approach. We demonstrate our valuing of each person through respect, truth, compassion and challenge. We in St. Mary’s College have concern for the whole person throughout the life of the school. We strive to have a good network of relationships in the school. We aim for a physically safe environment by having an evacuation plan, fire drills, fire exits and fire extinguishers and fire blankets. We aim to enhance psychological safety and well-being through the provision of SPHE, CSPE and RE programmes. We provide policies and structures that enhance psychological safety. These include pastoral care policy and structures, bullying policy, first year buddy system, school completion and rainbow/spectrum programmes. Staff members are released for in-services relevant to psychological well-being and safety. Workshops and staff talks are provided on relevant topics. 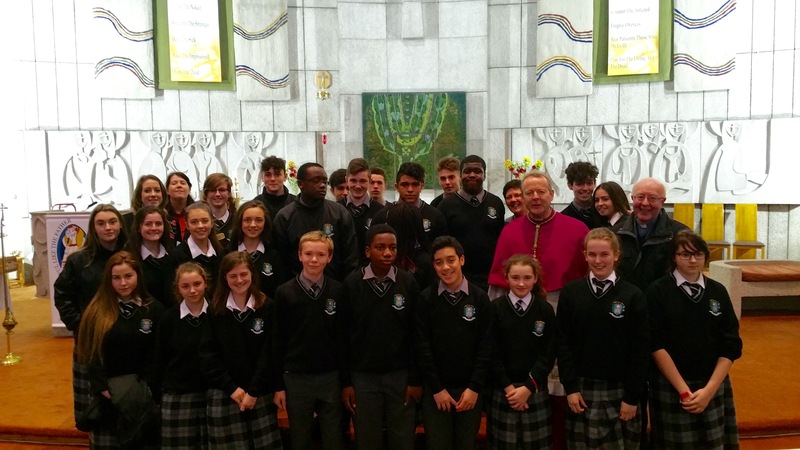 Archbishop Eamon Martin, Fr Jimmy McElroy s.m.,music teacher Ms Mullen, religion teacher Ms. Kelly and the St. Mary’s College choir. Subject Teachers, Year Teams, Year Heads, The Learning Support Team, Chaplains, Pastoral and Guidance Counsellors and the Principal and Deputy Principals all work together to offer pastoral support to students. We recognise the central role which parents play in the education of their children and we place a priority on establishing and maintaining strong relationships with parents/guardians. We aim to involve parents in school life and keep them informed of their child’s progress by means of exam reports, comments in the pupil journal, parent teacher meetings, text messages and telephone calls when appropriate.